For some, “Mockingjay Part 2”, the “final battle” in “The Hunger Games” blockbuster series will be a bittersweet swan song to a hero they grew up with. Others will be giving a mockingjay salute to the last new film to include Phillip Seymour Hoffman. I’m not sure where I stand in all this. I’m definitely not emotional about the series ending, but I’d wager Lionsgate and Co. will figure out a way to bring back Katnis Everdeen and her dystopian world in some way or another after this one explodes the box office. Last year’s “Mockingjay Part 1” ended abruptly and felt incomplete overall. That’s what happens when you split the final book in a YA series and expect it to feel like two movies – translation: go for a pure cash grab. Unless it’s a dense tome (think “Deathly Hallows“), it won’t. That’s why the second part in this final chapter feels like a movie that was put on “pause” and someone has now pressed “play” – only to find a continuation of heavy exposition and pushy, yet inert, drama. During the middle portion of the movie, I found myself thinking of other things. Never a good sign. “Part 2” opens with our hero, Katniss (Jennifer Lawrence), recovering from injuries she sustained at the hands of her friend Peeta (Josh Hutcherson) at the end of “Part 1”. Having witnessed the results of her friend being programmed and conditioned by the Capital, Katniss is now more than ever determined to take down President Snow (Donald Sutherland). 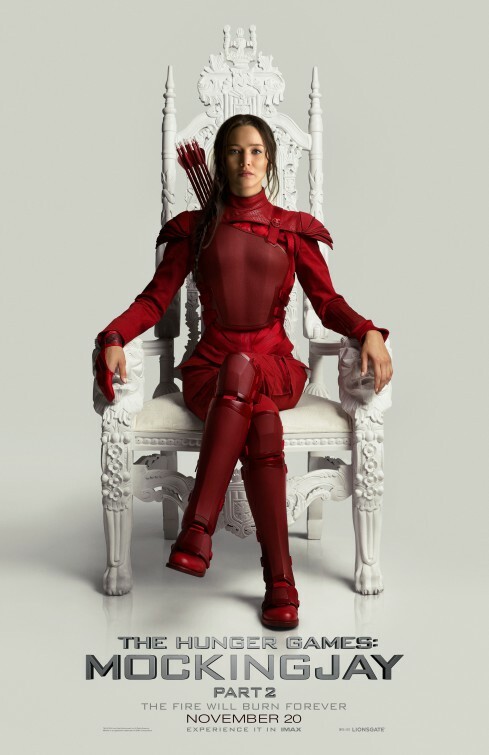 With the nation of Panem in full revolutionary war mode, Katniss joins an elite team of ten from District 13, led by Boggs (Mahershala Ali), among them some of her trusted allies – Gale (Liam Hemsworth), Finnick (Sam Claflin) – as well as Cressida (Natalie Dormer) and her camera crew, brothers Castor (Wes Chatham) and Pollux (Elden Henson), with the goal of assassinated Snow and ending his cruel regime once and for all. Aided by Commander Paylor (Patina Miller) from District 3 and Commander Lyme (Gwendoline Christie) and backed by President Alma Coin (Julianne Moore) and rebellion leader Plutarch Heavensbee (Philip Seymour Hoffman), who are eager to continue using the young archer as an icon for propaganda efforts. 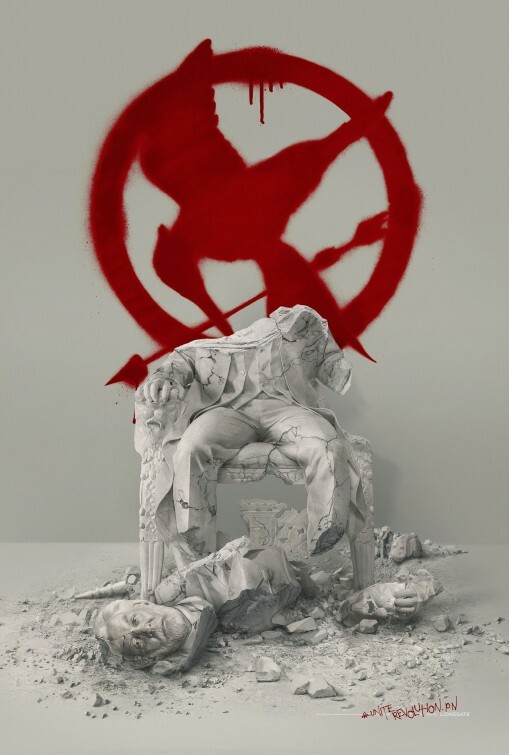 As Katniss eventually leads the way – with the encouragement of former Hunger Games winners, Johanna (Jena Malone), Haymitch (Woody Harrelson), and Beetee (Jeffrey Wright) – she must face the challenge of Capitol infiltration while evading numerous troops and booby traps as Peeta struggles to deprogram and overcome his urge to kill Katniss. This continuation is essentially an A to B movie, simply requiring its heroes to start in one place and finish in another. Despite its heavy action with attacks and explosions all around, there really doesn’t seem to be more to it than that. There are valid stakes and expected casualties that finds Lawrence once again solidifying her great star-making role as Katniss (delivering more exquisite slobber cries), who faces her greatest challenge yet in storming the Capitol. There are just no real surprises or upsets here, leaving viewers to watch out of obligation to close out a movie series. “Part 1” hinted at an urgent and determined next chapter, but director Francis Lawrence and screenwriters Peter Craig and Danny Strong, do not follow through on that promise. Instead of opening up the floodgates for the series conclusion, we witness one too many battle strategy walk-thrus and inspiring speeches that really drag down the picture. The end of “Part 1” indicated all hell would break loose here, but we never get anything grand in drama or epic in scale. Instead there are tired revisits to the forced love triangle between Katniss, Gale and Peeta. The big problem there is neither of them – Gale or Peeta – ever came across as believable love interests for Katniss. The problem thereis Katniss never came across as a girl who concerned herself with love, which was quite refreshing – and seeing how the media and master of ceremonies, Caesar Flickerman (Stanley Tucci, who shows up for a cameo since the games are over), spun that angle, it was interesting – not to mention reflective of real life (media, reality TV, etc) – but, ultimately the romance aspect in these movies (not the books, settle down) has been a real dud. If anything, “Part 2” solidifies Sutherland as the MVP of the series. Lawrence is the heart of these movies, but Sutherland is the diseased liver, grinning throughout and eventually bleeding out. He’s an uncannily evil antagonist and delights in the role. In each “Hunger Games” movie, he has stood out as the most intriguing and charismatic character, because Sutherland is so good at playing a dastardly manipulator. However, the supposed threat to Sutherland’s Snow, Julianne Moore’s President Coin, never really brings heft to the role – and honestly, her inclusion here (and “Part 1”) felt too much like other noteworthy actresses who’ve appeared in recent dystopian YA movie adaptations (see the “Divergent” and “Maze Runner” movies for Kate Winslet and Patricia Clarkson, respectively). “Part 2” does offers time inside the Capitol, which is something different. Most of it is evacuated and scattered with deadly booby traps called probes in anticipation of Katniss’s arrival, but it just winds up feeling like an elaborate studio backlot rather than a real lived-in environment. 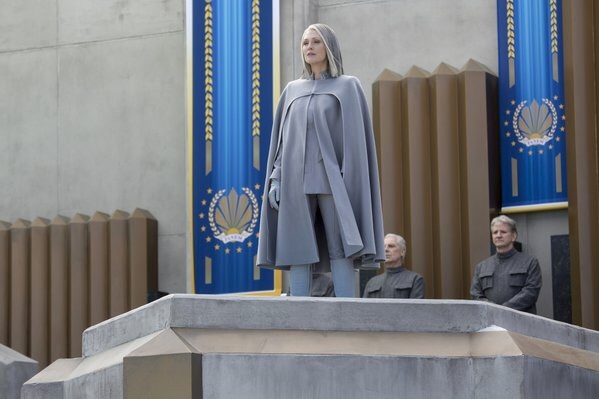 It helps that cinematographer Jo Williams casts the film with as much natural light as possible, providing a realistic environment especially when Katniss and her team trek through the sewer tunnels of the Capitol. However, the score by James Newton Howard is most of the time completely overbearing with operatic crescendos to emphasize (with a neon highlighter, it seems) crucial moments and quiet tension-building moments. Most of the action takes place within the Capitol, which should be intense considering the uncertain danger is around every corner, but the momentum just isn’t there with one too many unnecessary pauses instead of a legitimate emphasis on the understandable fears and betrayals that are hinted at. The series is filled with extremely talented characters who are often either overqualified for the roles or are just too brief. I was kind of miffed that there wasn’t more for Michelle Forbes (“True Blood” and “The Killing”) to do as Lieutenant Jackson here, but with so many characters, I guess that’s to be expected. Still, I thought she and Jena Malone were playing fascinating supporting roles to Lawrence. Effie, the chaperone played by Elizabeth Banks is back as well, but she’s deflated and left as a hollow shell of her effervescent self. 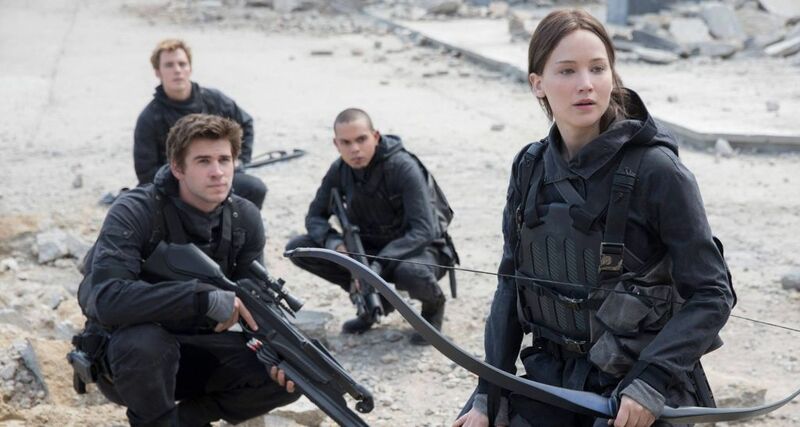 Outside of Katniss, there’s really not much to these characters and that’s mostly novelist Suzanne Collins’ fault. Her books were never lauded for their literary achievements, just their popularity in readership. Gary Ross, who directed the first movie released in 2012, did a stellar job building a cinematic world for the big-screen adaptation of her books and Francis Lawrence ran off with the rest of the movies, delivering the series highlight with 2013’s “Catching Fire“, yet he failed to craft a cohesive and worthy conclusion to the series in these “Mockingjay” halves. There should have been one final movie that utilized precise trimming and a concise running time, in order to emphasize the needed urgency and potent emotional intensity this film lacks. The last thirty minutes of “Part 2” feels both belabored and rushed. There’s a crucial death that is over with in a hot second that we never fully get to register. That’s crazy. The movie also ends on a disingenuous note that completely misses who Katniss has become. Nevertheless, Lawrence will forever be the reason the “Hunger Games” movies have done so well. She is fantastic, embodying Katniss with a raw openness and indignant longing for justice that has attracting viewers all this time. She’s not the reason these last two films are a letdown, but I’m sure Lionsgate will move forward with some kind of prequel, sequel or spin-off – hoping that the box office will be in their favor again and again.